This post aims to provide guidelines and implementation for a specific continuous transition between Android Fragments. 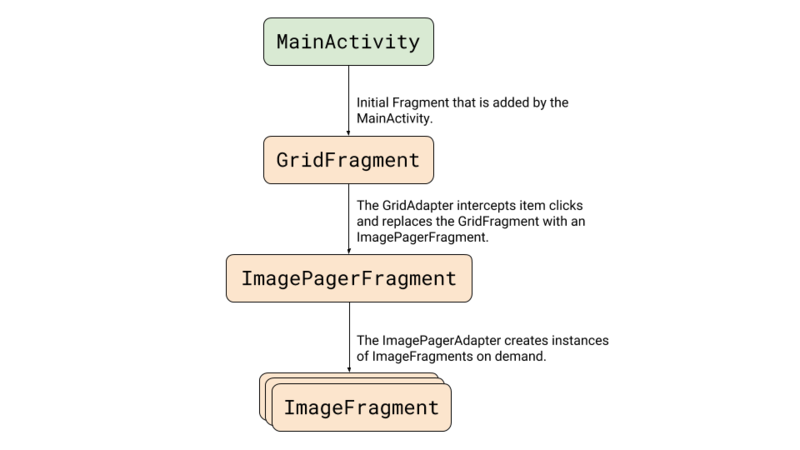 We will demonstrate how to implement a transition from an image in a RecyclerView into an image in a ViewPager and back, using ‘Shared Elements’ to determine which views participate in the transition and how. We will also handle the tricky case of transitioning back to the grid after paging to an item that was previously offscreen. There are numerous previously published examples which explain how shared elements work and how to implement a basic Fragment transition. This post will skip most of the basics and will walk through the specifics on how to create a working transition into a ViewPager and back. However, if you’d like to learn more about transitions, I recommend starting by reading about transitions at the Android’s developers website, and take the time to watch this 2016 Google I/O presentation. To do so, we will need to find a way to dynamically remap the shared elements in order to provide the Android’s transition system what it needs to do its magic! When an item is clicked, or when a page is changed, the MainActivity is updated with the relevant item’s position. When navigating back to the grid and auto-scrolling to the position to make sure it’s visible. And of course, when hooking up the transitions callbacks, as we’ll see in the next section. setTransitionName is called when binding a view at the grid’s RecyclerView adapter, and onCreateView at the ImageFragment. In both locations, we use the unique image resource as a name to identify the view. We set up SharedElementCallbacks to intercept <a href="https://developer.android.com/reference/android/app/SharedElementCallback.html#onMapSharedElements(java.util.List, java.util.Map)"target="_blank" attribute">onMapSharedElements and adjust the mapping of the shared element names to views. This will be done when exiting the GridFragment and when entering the ImagePagerFragment. We’ll start by adjusting the shared element mapping when leaving the GridFragment. For that, we will call the setExitSharedElementCallback() and provide it with a SharedElementCallback which will map the element names to the views we’d like to include in the transition. It’s important to note that this callback will be called while exiting the Fragment when the fragment-transaction occurs, and while re-entering the Fragment when it’s popped out of the backstack (on back navigation). We will use this behavior to remap the shared view and adjust the transition to handle cases where the view is changed after paging the images. To do so, we call a postponeEnterTransition() in our fragments’ onCreateView(), and once the image is loaded, we start the transition by calling startPostponedEnterTransition(). When transitioning back to the grid, a start transition is called after the “selected” image is loaded. Here is how the ImageFragment loads an image and notifies its parent when it’s ready. As you may have noticed, the transition is still not completely polished with this setup. The fade animation is running for all the grid’s card views, including the card that holds the image that transitions to the pager. These changes transformed our app’s fragment transitions to provide better visual continuity as users interact with it.